This brief book is a look at the life — spiritual and natural — of John Bunyan and his understanding of the fear of the Lord as traced through his writings. I’ll be the first to admit that I have only the most basic understanding of Bunyan beyond The Pilgrim’s Progress and that quotation from John Owen about his preaching (only cited twice in this book), so I can’t judge the scholarship of Beeke and Smalley when it comes to that. I can say that I thought their approach to both the man and the material could’ve been deeper. The brief biographical material did everything it needed to — it wasn’t too long and it covered the bases, giving an understanding of what he went through and his historical context. 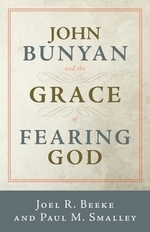 …Bunyan deduced that God forbids some fear as ungodly, but commends another kind of fear. This distinction proves to be crucial for Bunyan’s theology, allowing him to differentiate unhealthy, sinful fear from the spiritually sound and fruitful fear of the Lord. They examine the ungodly fear some more and then look at various spiritually sound fears — and the ways that is can promote growth in holiness and perseverance. A lot of this material was helpful — I’m not sure if it was because of the way that Beeke and Smalley compiled it or Bunyan’s insights that helped me the most, but I don’t think I understood any of the ideas the way I wanted to. Yes, the authors would point me at Bunyan and the Bible as a resource, but I think they could’ve helped me more. I thought the evangelical appeal at the end of the book a little out of place — it didn’t seem to fit the intentions or voice of the book up to that point — and I can’t imagine that anyone who isn’t a convert reading this book. I hope I’m wrong and that this is an effective tool, I should stress — but it seemed inorganic. This isn’t a bad book, it’s just a slight one. It’s too much of a survey, not an examination or an explanation. There’s no depth to the look at Bunyan, while there certainly appears to be breadth. I might have walked away with a better understanding of what kinds of things Bunyan wrote and when — but I don’t think it furthered my understanding of the man or his writing beyond that. If the authors had given use another 100 – 150 pages and I think I’d be writing something very positive. Disclaimer: I received this eARC from P&R Publishing via NetGalley in exchange for this post — thanks to both for this.